Editorial – Are Americans numb to mass shootings? It happened again. Then it happened again 11 days later. For those unfamiliar with recent events, what happened was a mass shooting resulting in 11 deaths Oct. 27 at the Tree of Life Synagogue in Pittsburgh followed by another mass shooting resulting in 12 deaths Nov. 7 at the Borderline Bar and Grill in Thousand Oaks, California. Within less than two weeks the U.S. experienced back-to-back mass shootings, neither of which resulted in anything more than what’s become the nation’s standard response. Thoughts and prayers were sent via social media. President Donald Trump and other politicians and public figures visited the communities affected. And policies remained unchanged, like they always do. The nation, and the world, seem to repeat this cycle each time the death toll of a shooting is high enough to make front page news. Then mass shootings seem to filter out of the news cycle and out of social media feeds faster and faster as each one occurs and little progress has been made toward reform despite a movement, started by Marjory Stoneman Douglas students that survived the Feb. 14 school shooting in Parkland, Florida, sweeping the nation. Instead, mass shootings have continued to occur on an almost daily basis in America, and the shooting in Thousand Oaks, California marked the 307 mass shooting in 312 days in the U.S., according to the Gun Violence Archive. A rarity in other countries has become so commonplace in the U.S. that people who survived one mass shooting were killed in another barely a year later. These tragedies now have their own routine and waking up to the stunning news of yet another mass shooting doesn’t shock the system or bring the nation to a stand still to mourn those lost like it once did. America has reached a sickening point. America has grown numb to the carnage. This was reflected in an editorial published by a number of news outlets around the country in response to the recent back-to-back shootings in Pittsburgh and California. Gazette Xtra’s Taylor Batten wrote, about how common mass shootings have become and noted how some news outlets use robots to write news stories that are completely predictable and formulaic such as weather summaries, sports recaps and corporate earnings stories. Because mass shootings have become almost as common, Batten and fellow editors crafted another predictable and formulaic template, this time for mass shooting. 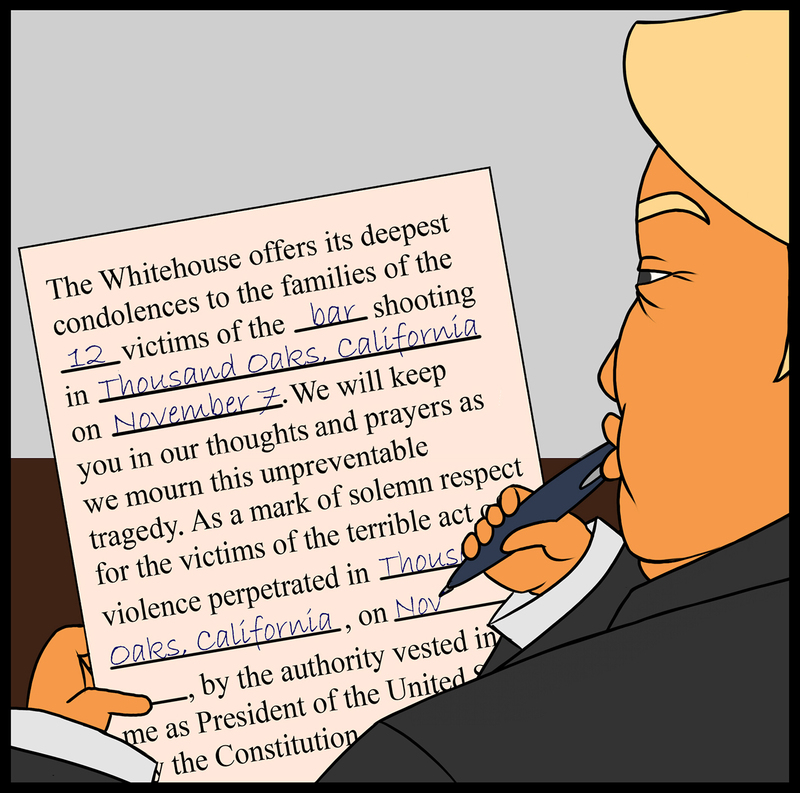 The editorial then continues with said template, an almost MadLibs style document specific to mass shootings. Nothing depicts just how common mass shootings have become or how numb U.S. citizens seem to be than this editorial. But this country can not become desensitized to the sound of gunfire or images of people fleeing. Grainy cellphone videos of people huddled in closets or classrooms or bathrooms should continue to stir an aching sadness in everyone that transforms into outrage to fuel the fight for gun reform. The lack of a clear path to end this epidemic must continue to frustrate Americans as their fellow countrymen continue to be gunned down senselessly. Every. Day. Not only in the streets of Chicago, but in houses of worship, bars, schools and movie theaters. Many of which are located in cities deemed the safest in the country. But a solution does exist and allowing the frequency of these tragedies to induce numbness and in turn tolerance of mass shootings is the last thing this country needs. So don’t shield your eyes or change the channel. Watch. Listen. Fall to your knees and weep for those lost and the communities forever changed. Then get up and fight for gun reform.